My boyfriend calls it “the look.” It’s when we’re relaxing, watching TV or reading, or simply enjoying our apartment, and I’ll start looking around and eventually get a faraway look in my eye. Now he cuts to the chase and asks, “Okay, what do you want to change?” because he knows that, as much as I love our place, I’m cooking up some decorating changes pretty much all the time. The vast majority of those involve lighting. While furniture and wall colors can affect the feel of a room, I find that plants, lighting, and music have the biggest atmospheric effect. We’ve got speaker wires running to every room, with all tunes controllable via smartphone or iTunes, and I’m all about dimmer switches, rope lighting, and colored lightbulbs — anything to avoid the dreaded overhead lights. Given how much work it’s taken to put all these elements in place, I’m kind of surprised it took this long for someone to invent an integrated smart lighting and audio system for the home. 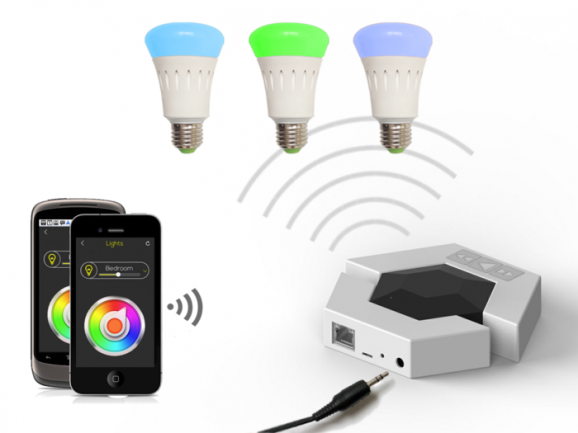 Belleds Technologies, another Cambridge, Massachusetts start-up, has come up with a system that integrates different-colored LED light bulbs with whatever music you’ve got streaming, essentially creating a syncopated light and music show in your own house. It’s called the “Q” and it’s got a station router that allows for communication between the light bulbs, the music, and a smartphone. Plugging speakers or whatever home audio system one has into the Q station makes it Wi-Fi ready, which means that it can link to any networked device that plays music. And when the music starts playing, the Q facilitates a light show based on the rhythm of the song. The smartphone app (available for Android and iOS) allows for customization of the lightshows, so one could choose to keep the lighting mellow or to have it strobe or something in between, depending on one’s mood. This means that, instead of changing all our lightbulbs when we’re having a party, we could simply put on a party playlist and let the Q system control the lights in a previously specified party mode. Beyond party lighting, the lights can actually indicate when users get email or text notifications — for instance, I could program Q to make all the lights in my house flash red if my mom sends me an email or tries to call. I could also set all the lights to green on Wednesdays, blue on Thursdays, purple on Fridays, etc. What’s more, the Q bulbs are energy efficient with lifetimes of about 30,000 hours each, and Q has a cloud-based analytics program that can tell users how much electricity they’re using. Since Q is open source, ambitious folks can program the system to perform other functions as well. Q is currently in the midst of a Kickstarter campaign seeking to raise $100,000 to get Q manufactured in bulk. Right now, the team has working prototypes of the bulb, app, and station and have secured manufacturing contracts, and the project recently won the MIT Clean Energy Prize Audience Choice Award. If successful, full-scale production would begin in October and the product would be shipped to backers starting in December. Needless to say, I’m backing this Kickstarter all the way, though I wonder what I’ll do for fun around the house.